A large number of beached sick and emaciated seabirds are being rescued along Santa Barbara’s coastline. 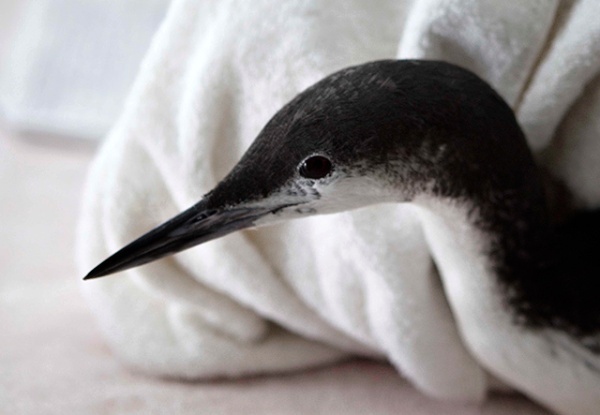 More than 40 birds – especially red-throated and Pacific loons – have arrived at the International Bird Rescue facility in San Pedro through the help of the Santa Barbara Wildlife Care Network. It’s unclear what is causing such bird strandings, but officials with California Department of Fish & Wildlife are investigating possible domoic acid poisoning – which is also affecting numerous California sea lions that are being rescued in unusually large numbers and brought to marine mammal care facilities. Domoic acid is a naturally occurring toxin caused by a marine algal bloom but is intensified by water runoff that contains land-based fertilizers. Crustaceans and surface fish like sardines and anchovies eat the algae which, in high concentrations, can produce neurotoxins that can destroy the brain. Seabirds that feast on the surface fish and crustaceans can ingest the toxic chemicals that produce sluggishness, brain seizure and possibly death. Loons are one of the more challenging families of birds to treat; they are high stress, strictly pelagic (deep water), and are susceptible to the onset of secondary problems while in care. Some loons currently in care are also suffering from neurological issues and need special medications to calm mild seizure-like behaviors. This unusual seabird stranding is taxing Bird Rescue’s resources, and the public can help care for sick seabirds with a donation for treatment. Find a medium/large-sized box and place a folded towel at the bottom. Place the bird in the box and keep in a dark, quiet place. Please don’t feed the bird. Leave the bird alone; don’t handle or bother it and always keep children and pets away.